What is Bitcoin’s Price Correlation With Other Digital Currencies? By learning more about the price correlations between bitcoin and other top altcoins, you will be better prepared to incorporate these digital assets into a diversified portfolio. 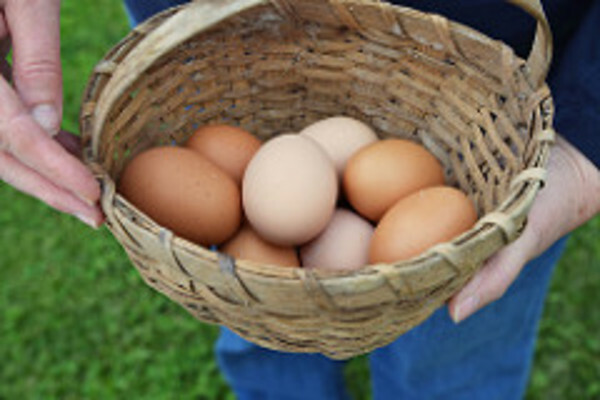 While some liken diversification to not putting all your eggs in one basket, there is more to it than that. Ideally, diversification will smooth out the fluctuations in your portfolio, leaving you with consistent returns. By combining assets that do not move in tandem with each other, you can better your chances of increasing this result. Knowing how different assets correlate with each other provides a road map you can use to diversify effectively. Through correlation coefficients, you can quantify how much using one asset will offset the price movements of another. Correlations range between +1, for perfectly positively correlated, and -1, for perfectly negatively correlated. As an example, suppose you have a very basic portfolio holding two stocks: ABC and XYZ. If a 10 percent increase in ABC coincides with a 10 percent drop in XYZ, the two stocks are perfectly negatively correlated, which will make them great counterparts for effective diversification. While ideal situations like the one just mentioned rarely materialize in real life, you can frequently find assets that provide less-perfect diversification benefits. If two assets have a correlation of -0.5, combining them can be quite helpful in eliminating risk. 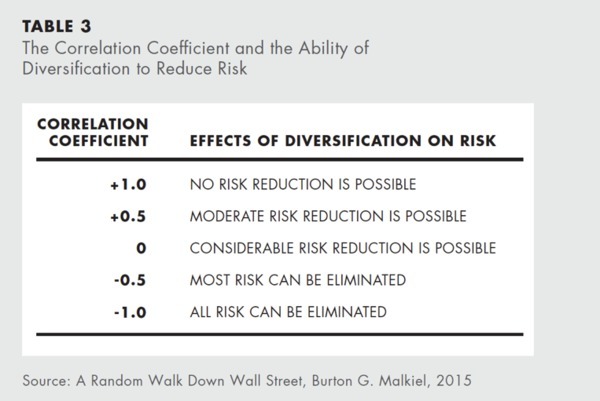 The graphic below shows some sample correlations and their diversification benefits. Now that you have some background context, let’s delve into the major altcoins and their price relationship with bitcoin. One easy comparison to make involves Litecoin, an altcoin that is very similar to bitcoin. 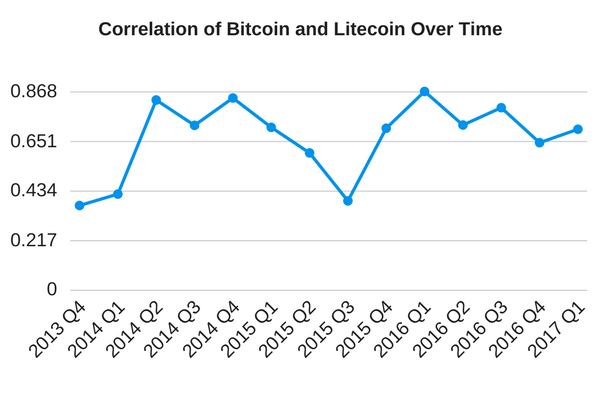 Litecoin, which has repeatedly been described as the silver to bitcoin’s gold, has frequently displayed a strong correlation relative to the world’s most valuable digital currency, according to a Bitcoin Market Journal analysis using data from digital asset platform CryptoCompare. As a result, the monthly price correlation between the two reached as much as 0.95 in November 2013, and surpassed 0.8 on several occasions. However, this tight relationship has broken down on more than one occasion. A perfect example is the multiple times that Litecoin has failed to keep up with bitcoin’s sharp rallies. It is also worth noting that while bitcoin has enjoyed monumental gains in the last decade, Litecoin has frequently failed to keep up. Bitcoin’s price has risen enough to provoke numerous stories about bitcoin millionaires who bought in at the right time, but stories about Litecoin millionaires have been less frequent. During a 2014 interview with Forbes, Litecoin creator Charlie Lee stated that “I’m sure there are Litecoin millionaires out there.” Since that time, the number of investors who have achieved millionaire status by investing in Litecoin may have surged. Given the lack of media attention to their success, it would be difficult to know with any degree of certainty. Ether became the second-largest digital currency by market capitalization in early 2016 and has primarily retained that status since. Over the last few years, the correlation between bitcoin and ether has been all over the place. At some points, these two follow each other very closely, and other times, the two digital currencies have almost no correlation at all. When their price relationship is examined on a monthly basis, the correlation coefficient of bitcoin and ether ranges from less than 0.1 to more than 0.5. 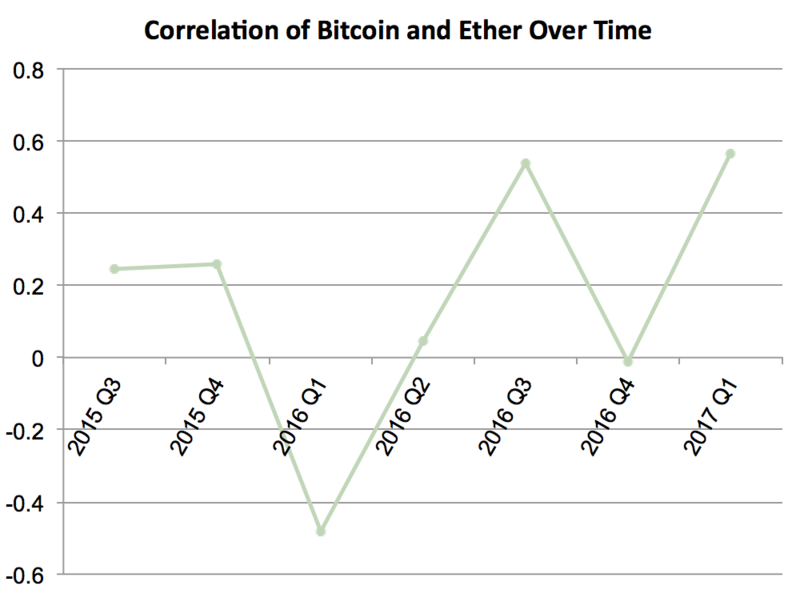 On a quarterly basis, the correlation between bitcoin and ether ranges between -0.02 and roughly 0.5. Ether classic is an alternative asset protocol or altcoin that was created in July 2016 when the Ethereum blockchain underwent a hard fork, a change in the platform’s rules. Not all users were willing to undergo the software upgrade needed to implement this hard fork, and the network split into two separate blockchains. One of these blockchains was Ethereum, while the other was Ethereum Classic. The latter chain’s native token is ether classic. Just like its older brother ether, ether classic’s price relationship with bitcoin is all over the map. 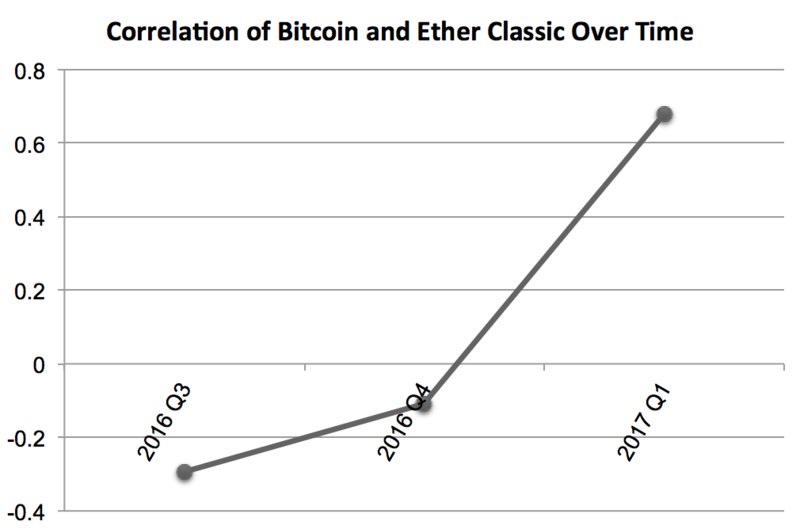 At times, bitcoin and ether classic have very little correlation. However, analysis reveals that the two had a monthly correlation of roughly 0.6 or higher during three separate months. XRP, the token of global payments network Ripple, has a price relationship with bitcoin that has ranged between weak (in this case, 0.2 or less) and modest (between 0.2 and 0.5). 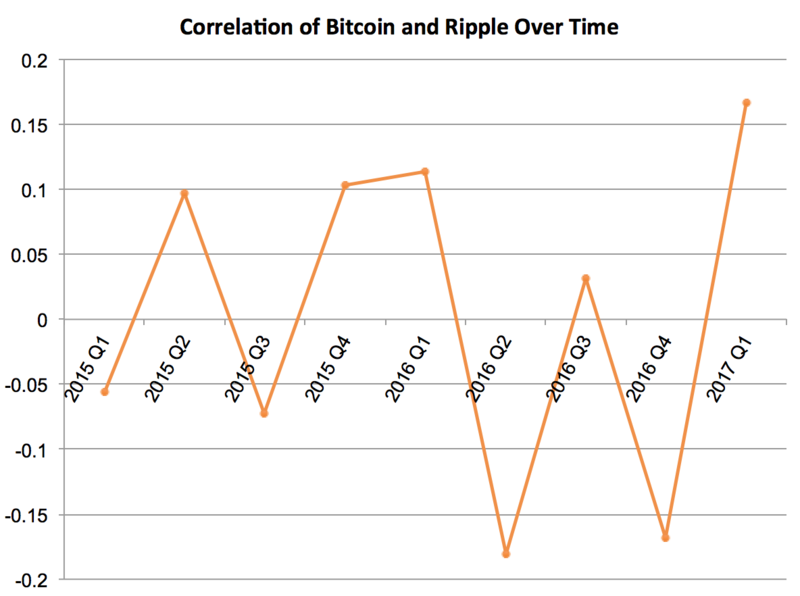 During the 27 months spanning April 2015 through June 2017, the correlation between bitcoin and the XRP token was less than 0.2 for 16 months. 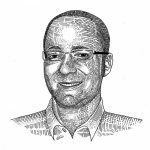 The price relationship between the two was between 0.2 and 0.5 during the remaining 11 months. While the aforementioned data may be helpful, keep in mind that the rules can change when markets respond to events or experience broad trends. In the first half of 2017, digital currencies drew broad interest, a development that coincided with their total value rising more than 500 percent, according to CoinMarketCap. During this time, the digital currencies examined in this article all enjoyed sharp gains. Bitcoin’s price climbed roughly 200 percent, while ether, the second-largest crypto, rose more than 5,000 percent, CoinMarketCap figures show. XRP climbed more than 4,000 percent, while ether classic appreciated more than 1,500 percent during this time. Litecoin also pushed higher, gaining more than 600 percent. When the broader crypto markets experience these bullish trends, correlations can rise significantly. While this may not seem like a problem when digital currencies are rising in value, it could be troubling if these digital assets all started losing value in tandem. If the value of digital currencies all fall at once, the simplest solution may be to simply stay calm and ride out the storm. Do not panic and sell, as doing so is likely the key to suffering losses. Knowing the correlations that exist between different digital currencies can be quite helpful. 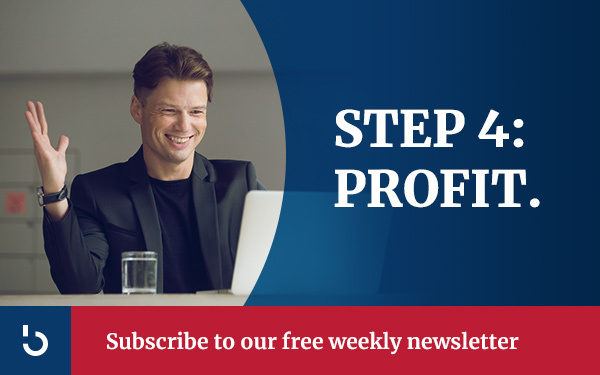 Armed with this information, you can construct a well-diversified portfolio and increase your chances of successfully managing the price volatility of these assets. Keep in mind that digital currencies are highly volatile, and some degree of price fluctuation is inevitable. However, this factor should not prevent you from putting the needed effort toward creating a well-diversified portfolio. For more helpful information on investing in bitcoin, subscribe to Bitcoin Market Journal.